Fine story if one manufacturer tries to inform all that he is in TOP-3 in Italy and other companies are not good. The discussion about quality is everlasting and if to "play with ethic rules" the most reasonable way is to close these discussions at all. Moreover press brake tools are very specified products with duration of life for years so it is hard to say how fast they will worn and for sure it is impossible to compare with competitors in the same conditions. The other story is special products from the manufacture like special geometry for affordable prices when everybody else offers it much more expensive and very special. 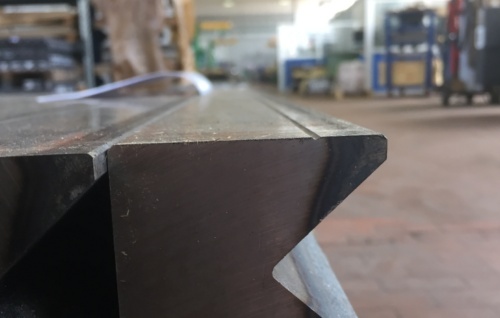 The main story to know in Italy that hardening is one for all which means that conditions in hardening will be the same if the material will be used nearly the same. As result more or less quality for everybody is near the same if the tools are “Made in Italy” and do not just marked after arrival from China. There could be other tricks like supply of standard geometry with 42CrMo4 material which is better but for sure these will be not the same conditions. So if the tooling will be made with requested tolerances without faults it will be good from any manufacturer. If something happened in production it is special case but not the question of quality for all goods. The other story of quality is following of project. There is impossible to have big and flexible press brake machine so when you buy special tools from most of suppliers you will get “theoretical solutions” which means that the tool will work but without 100% guarantee because was not tested. We would like also to say that not ISO or any other good looking document will not guarantee for you the perfect tool. If you need it better to request top-level from the beginning, do not calculate money but to get best of best. The principle of saving of quality is only one – to work with the good conditions to prevent defects of tooling before time. Burrs, overloads, same die for several thicknesses, coining instead of air-bending – these all factors which can dramatically reduce the life of your tools. Important to know that hardness is used only for working surfaces so you need to take care to work only with them. For example we had one customer who started to bend bars, real round bars with coining at the first week of tooling receipt and claimed that found the defects in the internal die groove. There are lot of stories like this with only one moral – follow the requirements or please provide to the manufacturer all the things you want to do. Last year’s there are a lot of talking about German quality tool but we would like to say that most of German companies have a close cooperation with Italy which means that the customer is just risky for overpayment for country of origin and finally will receive the same Italian tooling. But Germany is strong enough with special solution and special tooling or attacks.